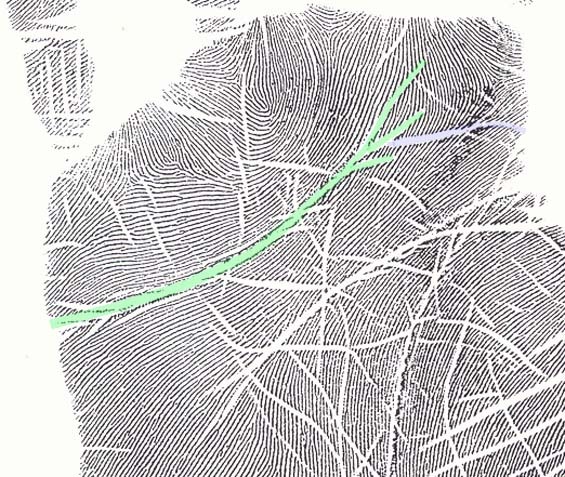 They have delineated the Suwon crease particularly from the Sydney crease as the Sydney has Accessory III (a stand alone heart line or fragments of a heart line above the Sydney line or long transversal head line). It appears they are coming up with a name for a long transversal heart line in a palm that has a head line too. The headline they are calling Accessory II. One more place they give a little description is in the caption in Fig. 3 "Suwon crease (D): II and III meet accompanied by accessory II. Although it says II and III meet - which implies we should see 2 creases meeting, a Simian Crease is also described as the meeting of II and III. The simian crease does not always have features that allow us to see where II ends and III begins unless there are branches. 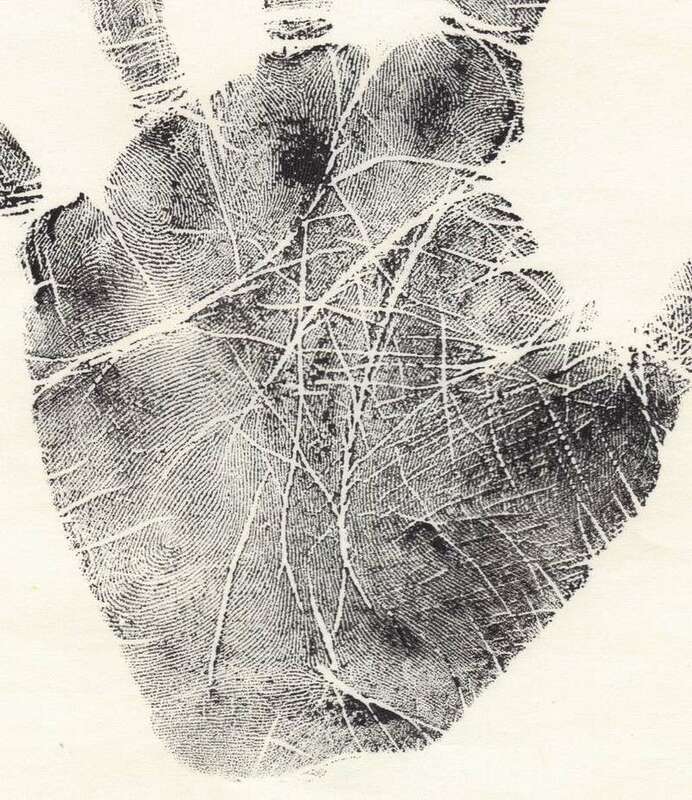 I'm thinking they are trying to identify/label a heart line that crosses the hand or a sort of simian crease that also has an (accessory) head line which comes close to the life line. Can you follow this reasoning Martijn and Lynn - or anyone else following this topic? ... Sorry, but to me your comment about A+E again illustrates that you still may not have understood the essential element of the 'Suwon crease'. 2 - Patti, can you tell me... WHERE is my highlighting 'subjective'??? 3 - Yes, I have recognized how the researchers described for a minor line: "narrower than the two times of the epidermal grove width in prints". I had already integrated that specific guideline in my new research approach for the major hands lines (which I will present at a later stage). And I am also aware that one could use that as an argument to qualify the yellow line in my example as a 'minor line'. But I think in this case the yellow line should not be classified as a 'minor line' because obviously it is an element of a larger constellation of multiple lines surrounding... and therefore an experienced observer SHOULD RECOGNIZE that one should avodi 'mis-use' of the researchers' guideline, etc. For... in this hand ALL 3 major lines show at the beginning the characteristic of being composed by 'multiple' entangling minor lines. And so does the 'Suwon crease'!! After coming to my most recent conclusion - I will say your female sample might be a Suwon. See the post that I posted just before your last. But, if someone presented the hand to me that you presented, I don't think Simian or Sydney would come to mind. Perhaps the hand has too many creases to be sure. Can you find an example that is clearer. Maybe that's why they eliminated the female hands - more creases and finer creases. Can you find other guidelines besides: "II and III meet accompanied by accessory II" and "creases have accessory II, which is close to I"? 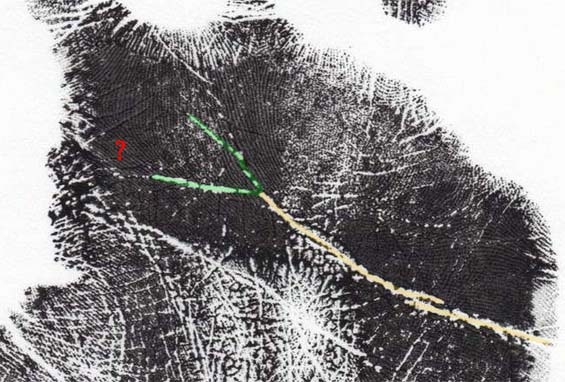 Patti wrote: They have delineated the Suwon crease particularly from the Sydney crease as the Sydney has Accessory III (a stand alone heart line or fragments of a heart line above the Sydney line or long transversal head line). But your green comments relate to the key-issue!! So, yes your comment makes perfect sense to me - though you better NEVER use the word 'simian line' when there is also a complete headline present!! anyway, I notice significant PROGRESS in your responses! And thank you for confirming in your last message that you now can understand why I presented my example!! I do believe we are basically on the same page now in understanding this feature. In that sense and thinking of your example..... if someone presented a hand with Accessory III and Crease II with an ending similar to the ending of your Crease III would you call it a Sydney Crease or a long head line with branches? I'm sorry about my vocabulary. I was aware I switched from crease to line and from distral transverse to heart line with no notice I just was too much in the flow of thought and writing to go back and edit properly. Shall we share the throne for the day! Martijn (admin) wrote: So, yes your comment makes perfect sense to me - though you better NEVER use the word 'simian line' when there is also a complete headline present!! Guess that's why they needed a name for this crease. ... A Sydney line of course!! Dear (edit) ms ... if you need to 'take a breath': sure that's just fine, I hope it will help you to ease down your mind-flow. Haha! I like the but it's Ms.
and now for my second large cup of coffee! Thanks Martijn for indulging me in this discussion. I think these last few posts have made the concept much clearer to all - except we may have lost and confused everyone along the way. Martijn (admin) wrote: And the reference in the text that II is close to line I... is not a key-element either: because in the accessory words featured with picture 3... I (= life line) is not mentioned at all!! I think that possibly the reason they mention Accessory II being close to I is so that a fragment 'head line' that may be in the middle of the palm or more ulnar isn't mistakenly used for Accessory II. To support my thought for this is that on page 171 (bottom left) it says "The terminations points of I, II, and III were variable between individuals, while the starting points were constant." Their focus was most likely on the beginning of II. It would have been helpful if in Fig. 7 they had included data for the Suwon's Accessory II the same as they did for Accessory III in the Sydney crease. It leaves you wondering if the diagram for the Sydney crease's II + III (bottom center illustration of Fig. 7) relates to the same start and ending points as for the Suwon. If so, then can we safely assume that Accessory II would have the same start and end points as in the chart for the II crease of the Normal creases (top middle illustration of Fig. 7)? Patti these prints for sure do NOT display an example of a 'Suwon crease' (the left hand can at best only be described as an 'incomplete simian line'... EDIT: plus a 'large interruption in the heart line'). So, both hands do not display THE essential characteristic of a 'Suwon crease'... ! The right hand, top print does have all the qualifications of the Suwon crease! On the right hand I'd say the start is just as strong as your sample. Your sample fades as it approaches the radial edge. The quality of the print isn't good, but it has branching that can be detected as does the one you uploaded. I added the left hand to show how the crease formed in the other hand. We typically look at both palms. Perhaps Martijn you are adding more requirements than do the researchers? Patti wrote: The right hand, top print does have all the qualifications of the Suwon crease! Sorry Patti, I think we better avoid ANY speculation based on low quality prints... I have illustrated your example with some colors: I think this is a typical 'splitting heart line'. EDIT: Especially since there is hardly any difference between both branches! I think it has NONE of the three typical characteristics of a 'Suwon crease' that I described earlier in this discussion. EDIT: And I can add a fourth requirement: a true 'Suwon crease' typically has a strong beginning at the thumb-side of the palm... and formally the line should at least be wider than the width of 2 ridge lines. I think it is obviously that this print doesn't meet this 4th criterium either. PS. I assume that you don't want to embrace the activity of seeing things that are not really there... and I have added the '? '-mark just to illustrate that there is for sure no clear evidence of a 'Suwon crease'. Can you my observation as a fact? If not, please explain why!! 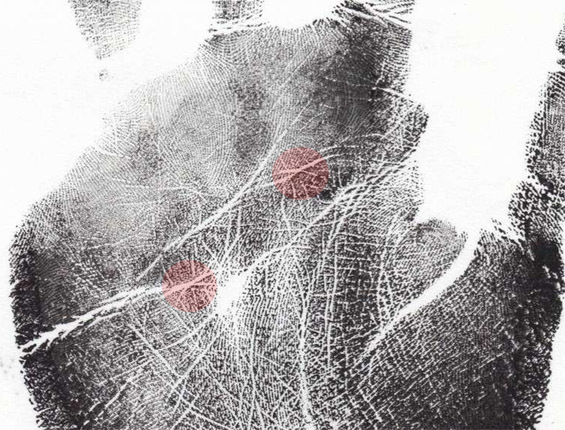 If we apply the same criteria to your sample, the creases at the radial edge may have nothing to do with the heartline - they may be simply empathy lines. Patti, can you please specify... !? Regarding the left hand... I observe an interesting repetition of elements: such 'signs' could also be used to make an evaluation; in this example it could be recognized as a confirmation that the lower branch is also belonging to the heart line. Resulting in that this is probably not a 'splitting heart line', but it is a 'branching heart line'! I never associated the left hand with a Suwon, just the right one. I shared both hands of the same person. The Korean researchers looked at both hands. As you often request to see the other hand to help answer questions. Your sample is made up of too many short branches. 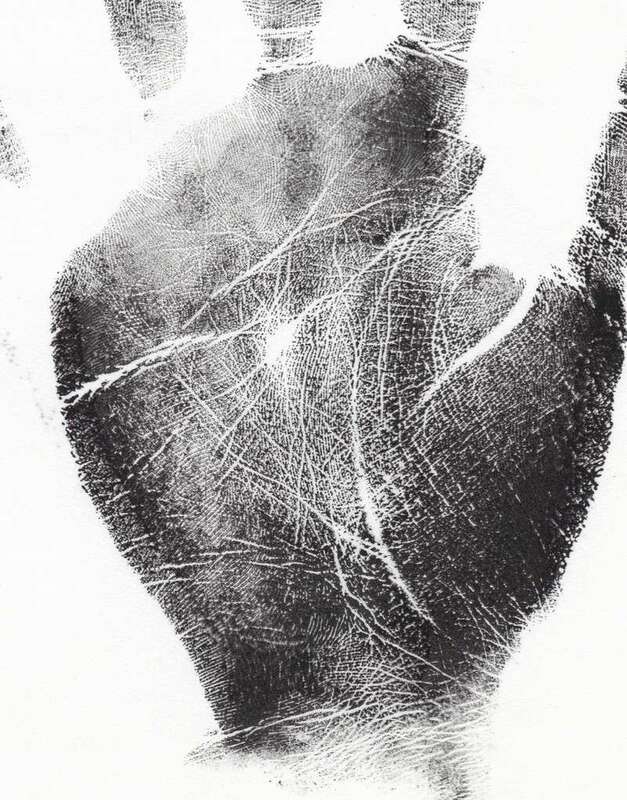 Some may be related to creases that form curving under the ring finger and unrelated to the heart line. Maybe instead of continuing to split straws or creases over this print - you could just present a better sample. Your sample's branches also fade as they approach the radial edge. I said I could agree earlier because at that time the point being made was that the II crease connected to the III crease creating a long transverse crease. If you are stating that the beginning needs to be more precise than the right hand sample I uploaded - or closer to the radial edge - then that eliminates yours. Looking at Fig. 7, the authors put a black dot for the beginning of the head line or II crease as the same place in the Normal, Simian and Sydney creases. We all know that these have more variance than they indicate. For Normal they only show the percentages for the endings yet show they all start at the same point. For the Simian and Sydney the same starting point but different distances from the distal edge of the palm. This would seem to me, they are describing a *normal* start - not necessarily an extreme radial start. As you even said earlier you would describe a Sydney crease to include one that has branches taking it to the edge and fading as does yours. Patti wrote: I never associated the left hand with a Suwon, just the right one. I shared both hands of the same person. The Korean researchers looked at both hands. As you often request to see the other hand to help answer questions. Patti, presenting both hands is of course perfectly fine! But before your last comment (quoted above) you hadn't mention why you presented both hands of one person. So far you hand only presented one hand for each case, so... how could I know that in this example you basically only wanted to hear feedback on the right hand ??? PS. I will later make an additional comment regarding your other thoughts. I can understand that since I didn't mention why I uploaded both hands. I've sent an email to the author mentioning the female samples and inviting them to take a look at our discussion and maybe even provide us with some stronger guidelines. Patti, I think you have started to translating my words into 'out-of-context' conclusions: basically I only tried to describe that the start of a headline really needs to be clearly visible...!! In the case in my 'high quality' female-example the lines are clearly visible. But obviously this can not be said about your 'low quality' example: where we can only see 'dots'. Yes, some of them could relate to line parts - but we can not be sure about that! And of course... you're welcome to present a higher quallity version of the same hand. But regarding your 'attempt' to compare my quality print with your poor-quality print... how could that add to the quality of this discussion??? 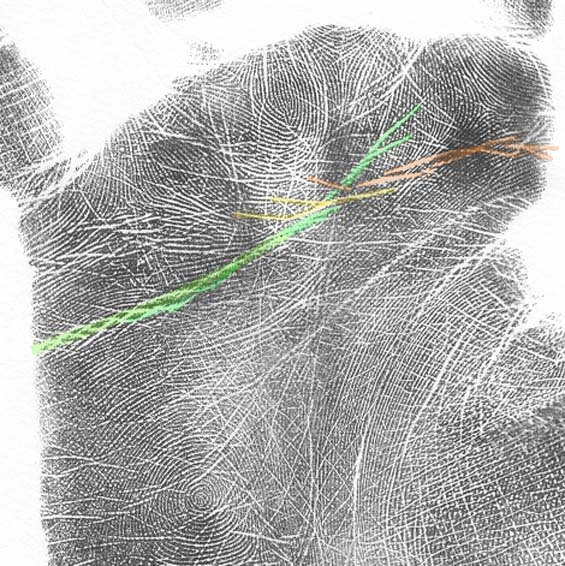 Regarding your observation that "too many short branches" are involved in my first (female) example, sorry... but I think all lines that I labeled with color (yellow + orange) are very clear, and some of them definitely meet the researchers definition of a primary line. So, I can not agree with your observation that in my female-example the lines are 'fading'. I also do think that my female-example actually very much resembles the characteristics... of my VERY FIRST male-example that I presented earlier in this discussion, see: 21 Sep 2010 - 12:13 (see the second example below). By the way, did you actually notice that you actually that example??? If so, I wonder why you ask for another example... without a discussion of that one. Anyway, I'll add another example (third example below) of my collection... so that you can STUDY the common details in my sample of 3 examples. - (3) the extra line has a likewise strong (or stronger) structure as the first half of the head line. Patti wrote: I can understand that since I didn't mention why I uploaded both hands. If it's simply the quality of the print, I agree. 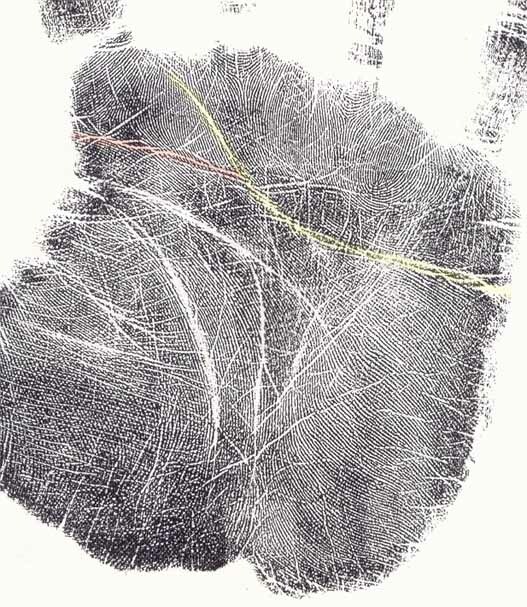 I think it displays all major requirements to be recognized as a 'Suwon crease' (except that we can not see the last quarter of an inch in the radial zone involved - but the line appears to be very solid so in this case one could 'quite safely' assume that it does reach out to the SIDE of the palm). 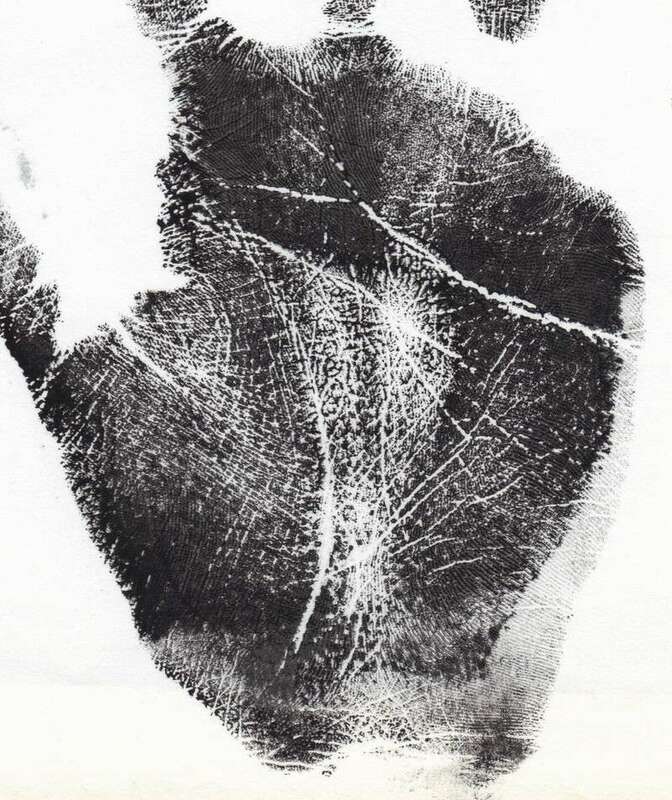 So, if I had found that handprint in one of my samples, I would have counted it as a 'Suwon crease'.